Black History Month is coming to a close, so it’s a good time for readers to grab a copy of Ronald Wimberly’s Black History In Its Own Words (Image) and gain a resource that can be used to continue exploring black history all year round. Composed of 40 portraits (including Wimberly’s self-portrait for the foreword) of black Americans who have played a major role in the country’s past and present history and culture, this art book is a striking showcase of Wimberly’s bold graphic art style and his ability to evoke a rich personality in a single shot. Each portrait is accompanied by a quote from the subject along with a short biography on the opposite page, and this small amount of information is very effective in creating an urge to keep exploring the works of these entertainers, artists, athletes, scientists, philosophers, politicians, and activists. Black History In Its Own Words originally started as a Black History Month project for The Nib in 2015, and the book’s portraits are organized by year, with 12 in 2015, 12 in 2016, and 15 new pieces for 2017. There’s a clear evolution in Wimberly’s approach from year to year, with the first 12 providing basic presentations of the subjects and their words. There’s still plenty of energy and attitude in these portraits, but the rendering is simpler and the lettering less graphic than what Wimberly does in 2016, using more screen tones to add extra dimension to the images while incorporating new graphic elements to make the quotes and the names more prominent. The portraits for 2017 eliminate the screen tones in favor of more detailed shading, but keep the graphic ornaments. 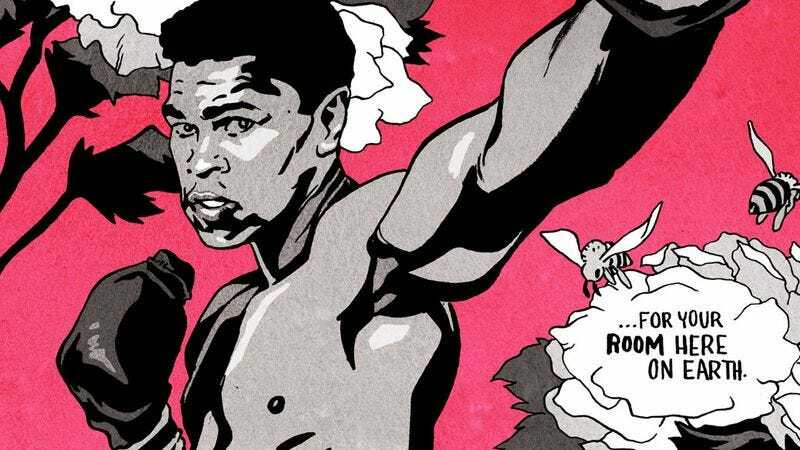 The most striking image in the book is the portrait of Muhammad Ali, shown throwing a punch while a butterfly and two bees fly around flowers in the background. It’s a gorgeous depiction of Ali’s “float like a butterfly, sting like a bee” catchphrase and a very clever way of incorporating that quote without spelling it out on the page. The Prince portrait also features some beautiful design work, with his name and quote presented in the silhouettes of doves flying through the air; Wimberly also does a remarkable job of capturing Prince’s attitude as he plays his guitar on his knees, making penetrating eye contact with the reader. The choices the artist makes in the composition and content of the portraits reveal how he wants the reader to perceive these figures. Lena Horne is presented as she appeared at the 1963 March On Washington, an image that accentuates her role as an activist rather than a glamorous Hollywood star. One of the most interesting choices is the addition of word balloons for Fred Hampton and Lee “Scratch” Perry’s quote, which bring extra force to their words by having them come directly from the subjects’ mouths. These portraits are small glimpses at these figures, but they have a power that compels the reader to learn more about them and their place in American history. By the time she died at the age of 32, Cass Elliot had crafted an impressive and vibrant musical legacy—first as a member of The Mamas & The Papas and then as a solo artist—a legacy that included songs like “California Dreamin’” and one of the most famous covers of “Dream A Little Dream Of Me.” If people know Elliot, it is by way of this legacy. But as the French cartoonist Pénélope Bagieu traces in her new biography, California Dreamin’: Cass Elliot Before The Mamas & The Papas (First Second), the singer’s life before stardom was far more interesting, and even more so with the telling. Illustrated in a rough and wispy style, California Dreamin’ tells the story of Elliot from her childhood to her breakthrough as a celebrity, a different character narrating each chapter. Elliot herself never takes on this role, with her story told instead by her deceased father, childhood friend, lovers, and bandmates. Through their eyes, Elliot becomes an enigmatic figure. Some characters see her as tragic, while others see her as a blustering natural phenomenon. Bagieu offers Elliot a richness and depth without objectifying her. But with no interiority, she remains almost inaccessible. A lack of consistency in perspective means who she is—or who she seems to be—is always shifting, and this makes it difficult to pin Elliot down in the way readers might expect in a biography. California Dreamin’ subverts the most common of biography tropes: the idea that such a work will offer revelations of or about a public figure. There is nothing about the psychology of Elliot to be learned here, nor are there historical discoveries. Instead, Bagieu fictionalizes Elliot’s life—not in the sense that Bagieu interjects untrue elements, but that she treats Elliot as a fictional character, and she brings the tools of fiction to bear on that character. As a result, Elliot is not a figure we are to learn something about; instead, she becomes an objet d’art to reflect upon and interpret. This is most notable in the rough hewn and dynamic aesthetic of California Dreamin’. Whereas Bagieu’s earlier work was made up of simple compositions, clean lines, flat colors, and intuitive page layouts, California Dreamin’ is not. Where that previous work was solid, this book is elusive. Bagieu leaves her pencilled lines uninked and uncolored, and her panels sometimes blur and blend into one another. These choices—aside from catching the eye—lend the work an immediacy. The story moves with an ease and grace. This look also imbues the book with a sense of artifice, which draws out certain elements of Elliot’s character and offers multiple angles by which she may be viewed and (more importantly) reviewed. When Elliot dances, her body sways; like in a shojo manga, the background drops away, and Elliot leaps out from any spatial context, allowing her body to become a vehicle of pure expression—movement, emotion, line, and energy without any insisted upon meaning. California Dreamin’ leaves the reader to unpack these moments and scenes for themselves. Bucking conventional wisdom, The Can Opener’s Daughter (Self Made Hero) proves that the second entry in a trilogy can in fact be the stronger one. Following The Motherless Oven, released in 2014, The Can Opener’s Daughter opens on a flashback to Vera Pike’s childhood, focusing almost exclusively on the first book’s least sympathetic character. In The Motherless Oven, Vera oscillated between manic pixie dream girl and an outright cruel child, and though there was some inkling that there was more going on under the surface, the focus on the first book’s protagonist, Scarper Lee, never gave Vera enough space to be anything else. By focusing The Can Opener’s Daughter on Vera, writer and artist Rob Davis gives readers a chance to understand not only her but also the world she comes from. The Motherless Oven often felt a little adrift in its own mythology, stumbling through the balance of characterization, plot, and world-building. With a foundation built, The Can Opener’s Daughter can hit the ground running. Introduced along with young Vera are her mother and father. In the world that Davis has made, people manufacture their own parents as young children, limited only by their imaginations. Many children make fathers that are large enough to ride as transportation; Scarper Lee’s father was a massive brass machine with sails, kept in the shed. Vera’s father, on the other hand, is a can opener. She carries him in her pocket and uses him to pick locks, and he often cajoles her to listen to her mother, the Weather Clock. Vera’s mother is at the heart of their world’s government, controlling the weather and dictating the terms of everyone’s existence. Trapped for years in a home that’s contentious and filled with threats and mystery, Vera is shipped off to boarding school, where she learns the cruelty of young girls and the even more striking cruelty of her mother. As the story moves forward, approaching the point in The Motherless Oven where Vera met Scarper, it becomes clearer and clearer how Vera became that girl the reader met in the first book. The back half of The Can Opener’s Daughter moves her adventure forward as she goes to rescue Scarper with their friend Castro Smith, with Vera’s mother and the mystery of their manufactured world unraveling around them all. Davis has created a story full of emotion and adventure, following in the footsteps of the best young adult novels and graphic stories. It trusts the reader to be mature enough to recognize an unreliable narrator as well as what has turned her into such a distrusting, angry person. There’s enough philosophy about the nature of being and the root of creation to push even adult minds, all framed through a dark and atmospheric adventure. It’s the Labyrinth of graphic novels, caught up in a mythology that’s grander than the books can begin to explore, and if the third in the trilogy surpasses the second to the same degree, readers will have a remarkable ending.